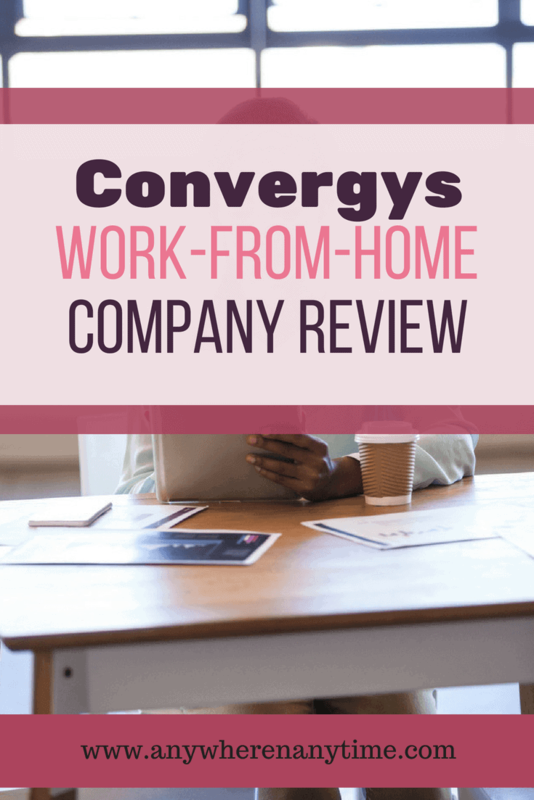 If you are a people person, enjoy helping out others and solving their problems and are ready to learn about new products or services, but you would like to do it from home, check out this Convergys work-at-home review. A majority of their at home positions are for customer service and sales & service. I’ve heard that there are also technical support home positions, but have not seen one myself. Convergys is a call center company that that prides itself in offering its customer management services to many of the top 50 Fortune 500 companies. The company, though based in Cincinnati, provides jobs in North America, South America, Europe, Africa, UAE and South East Asia, now that they are in the process of merging with Stream. They offer work-at-home positions for some of their different projects in the United States. High internet speed requirements: Since Convergys operates on a VOIP line, they do have high requirements for your internet connection. For some, this may be an issue that simply cannot be overcome. Convergys provides services to various businesses both from their call centers as well as through their home based telecommuting positions. They have many different projects running that are both inbound and outbound telecommuting positions. The majority of projects available for work-at-home positions are in their sales & service and customer service departments. How do you join Convergys? Getting started with Convergys is a pretty easy process. 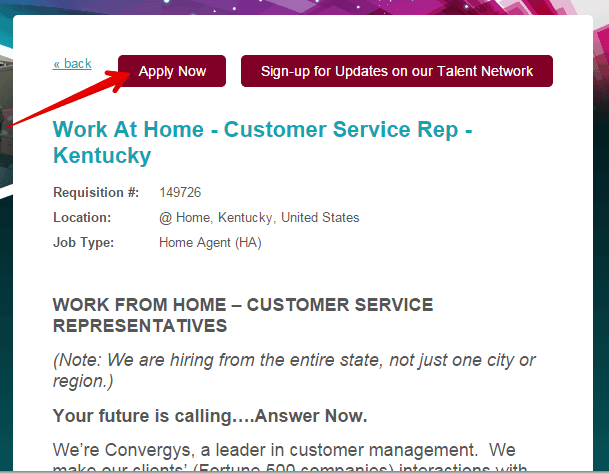 You can initially join their talent network at http://careers.convergys.com/home-agent.php by clicking on the button that says “Join Our Talent Network.” You can find out the available home based positions here and then actually submit an application if you find something that suits your needs. From there you will receive phone call from a member of the Convergys recruiter team who will help you complete your full application – there are some internet tests and additional steps that you have to complete prior to starting work with the Convergys. If you qualify, the recruiter will discuss the best position for you based on your answers to the questions during the application process, your qualifications and your experience. If you’re someone who wants a work-at-home career option and you have the ability to not require a set schedule, then Convergys could be a great fit for you. If you need more flexibility in your schedule, or you don’t have the experience that Convergys requires, then you will want to look into other opportunities. Since you are working as an actual employee, you will be paid just as you would at any other job. The wages are hourly with employee benefits. Some positions qualify for performance based incentives on top of the hourly wage. Expect to be paid every week or every other week, depending the project you’re assigned to. You receive payments via direct deposit to your bank account. All training at Convergys is paid training. 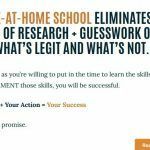 The training for work-at-home employees is virtual. The training schedule varies from project to project however and the duration of training will depend upon which project you are assigned to. You will find out more about training times and details during the application process. There are mixed reviews about the quality of the training – some agents have said that Convergys offers some of the best training in the business and others don’t feel that way at all. A lot of agents report that there is more than enough support offered via phone, live chat, and email. Also, unlike most work-at-home companies, you are working as an employee and will have an immediate supervisor assigned to you. I have mixed opinions about working for Convergys. The reviews about time off, benefits and training were mixed – both good and not so good. Also the requirement of being available 7 days a week for scheduling is not very practical. Of course you don’t work 7 days a week, and once they have sent you your weekly schedule, you know when you will be free. But still the fact that you may have to work weekends when everyone else is home, may prove difficult. If you are looking for a legitimate company to work for that will offer possible overtime and pay with benefits, this is a good company to work for. If you need to have a lot more flexibility with your scheduling, or you don’t have enough sales or customer service experience, then you may want to look for other opportunities. Verdict: It is a legitimate job, but it is not anywhere or anytime. Have you had any experiences with Convergys? If you have feel free to share them below. And if you have any questions, just ask! This was a great article. If I’m gonna sit in a cube and have to be available 7 days, I might as well do it from home. I’ve been debating whether or not to apply to Convergys—I think I will. Beats going to work everyday. If I have a 15″ will they know it is? I got an email and would hate to not get it because of 2″. I’m sorry, Jessica. I have no idea. I just researched and reviewed the company. I don’t have any practical experience working with them. I am trying to run the PC test and my email is not being recognized. Do you have any suggestions as to what I can do? What laptops are compatible with the requirements and system? I work for Convergys work at home. It is the perfect job for me since I am disabled and have trouble working in a call center. The pay depends on the job but it is at least $9 an hour. As a rule you get either Saturday or Sunday off but work the other one. Schedules are done by shift bid. Raises are based on attendance – yes people call in sick a lot even with a work at home job. The computer requirements are because of the software you have to run. The internet speed requirements are because your phone is done through VOIP and there is a minimum speed requirement. I don’t hardwire in and use WiFi and have never been busted or had a problem with that. I also use a wireless mouse and headset and have never been busted for that either. If you have a good internet connection others can be on while you work, the only problem would be if it slowed your connection down. Thanks a lot, Rene, for your feedback! Hearing fresh info from the inside is really valuable. Hello RNB, it was really good to see your input. I put in an application and just finished the PC Test. Hopefully I’ll hear something by next week. how long after dong the pc testing do you hear more? So you can use WiFi and it works the same as long as its high speed internet? You can’t use WiFi. They can tell if you are WiFi or using a USB cable. Once you do the testing you can try to use WiFi. If you ever have to call IT you need to be sure and connect your USB. how long after doing the PC test and internet test and it says pass in each area , can I expect to hear more? I did the computer and internet testing and passed so now what? How long it takes to hear back will depend on hiring needs. It should be within a week or two. RNB is it possible to use a laptop instead of a desktop for the test? As long as it meets the requirements then you can use a laptop. The main problem is the screen size. Most laptops don’t meet the screen size requirements. Robin-I don’t see the hourly pay mentioned anywhere. Of course I could have missed it. I’m semi-retired from Ford Motor Credit Company in Collections and Customer Service. I’m probably wanting more money than I can realistically make! What can I hope for from any of the companies that offer Work at Home? No, the hourly pay isn’t mentioned anywhere. Information was changing even as I wrote the article. So I left out things that would be outdated easily. 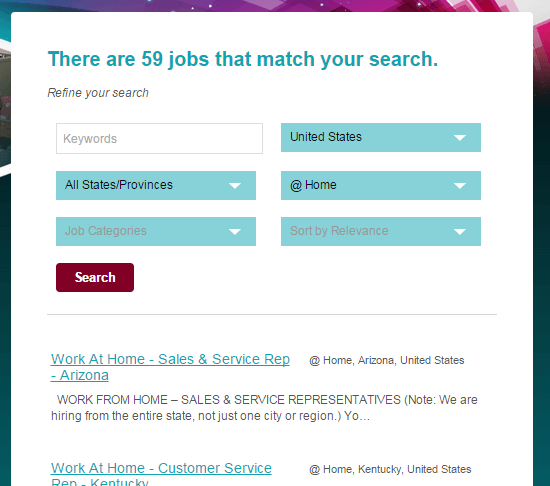 I would suggest exploring here if you ar looking for a work-from-home job and see what they have to offer. Do you guys have customer service base at home in UAE? I do not represent Convergys, but only wrote a review on the US based work-from-home employment options in the company. Great site name, lovely eye catching header. Very beautiful site. Convergys look interesting, but one question pops up do you have to be living in a particular country (USA or Canada for example) in order to work for this company? I do know a few friends that may be interested but, are not based in the States or in North America. They do have extensive call center experience. To answer your question, you do have to be in the US to get a work-from-home job from Convergys. But they also offer regular call center jobs in many countries all over the world. When I wrote the post, they were in the process of expanding and merging with another company. So I’d advise you to check out their site to find the most recent information. Convergys looks great to me as you get hourly wages with employee benefits. The support seems to be high quality because there is Live Chat available. Most companies I have encountered don’t have this aspect in place. They mainly use e-mail. Great to hear that Convergys cares about their members. I would definitely recommend this to my colleagues who are looking for work from home jobs. Awesome info, thanks! Wow, a work at home article that actually shows you a real at home job opportunity. I was starting to wonder if these actually existed. While Convergys does offer a true work from home job which has a the benefit of no commute, the drawbacks outweigh the advantages for me. You seem to deal with many of the same kinds of restrictions that you would expect if you worked in a cubicle somewhere. 7 day per week availability, only a hardwired internet connection is allowed and nobody else in your house can use the internet for anything non work related. For me, all of these conditions and restrictions seems to eliminate the reasons most people would want to work from home in the first place. Don’t get me wrong, I love working from home, but I work for me. I can sit by my pool on my wireless laptop while I work. I agree with you completely, Steve! The whole point of working from home for me is the freedom involved. Thanks for your thorough and detailed review. I am always looking for ways to augment my current income, so this was helpful. It sounds like the lengthy and quite drill down recruitment process is used to make sure the potential recruit is aware of the requirements to work with them and the company can see they are qualified/willing to meet their stringent standard. (3) Dealing with the malcontents having problems over time would burn me out, I have been in a position like that and it was no fun! Thanks to your excellent review, I will not waste my time with this company. Although they sound legitimate, the”buts” outweigh the comfort of having other jobs where you can work from home without all these “buts.” You have saved me time! Actually, Dave, you don’t have to work 7 days a week. But they can schedule you any day of the week. Once you know your schedule each week, you know which days you will have off. I don’t think I could be a sales or customer service person either. It takes a lot of patience! Glad the review was useful in some way! I had never heard of Convergys, but your review clearly explains both the pros and cons of working for them. For me, having to be available for work 7 days a week, would be a deal breaker. I don’t think I could have a good work-family balance doing that. Also, not allowing for others to be able to use our home internet connection while I work, would also be inconvenient. Do you personally know anyone who has worked for Convergys? No, I don’t know anyone personally. This review is based on research from several forums and other sites. Of course the Convergys site makes it sound like it is the best place ever. And there are employee reviews that agree with that. But there are just as many that didn’t think it was the greatest place. The thing is that there are so many variables that influence a person’s opinion, that it is really hard to say. That is why I tried to include as many actual facts as possible. I agree with you about both points on this one!